Nintendo NES Cart. 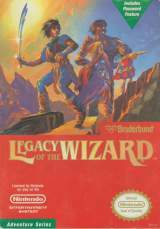 published 30 years ago by Broderbund Soft., Inc.
Legacy of the Wizard © 1989 Broderbund Software, Incorporated. North American release. Game developed in Japan. See the original Japanese version for more information; "Dragon Slayer IV - Drasle Family". 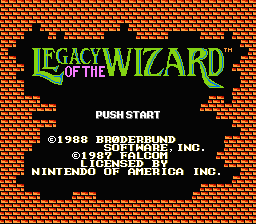 Legacy of the Wizard was released, 2 years after the original Japanese version, in April 1989 in the USA.